Jimmy Porter has moved to stay with relatives in Central Australia — the harsh red centre of the country. Outback life in 1927 is tough, and communication with anywhere is nonexistent. Jimmy gradually begins to appreciate the beauty and the wonder of the outback — and of the resilient people who live there. But when disaster strikes and he and his cousins have to trek for help, Jimmy witnesses just how important the new Flying Doctor Service is. 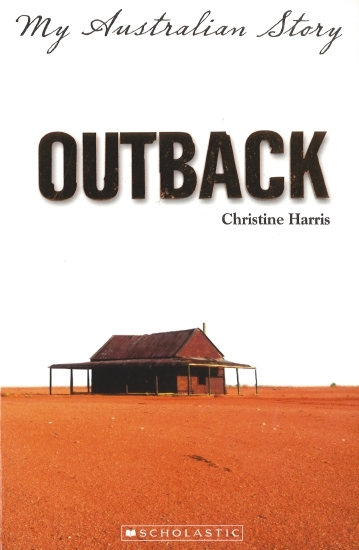 Outback is filled with memorable characters and classic yarns. It also demonstrates the vital service that the Flying Doctors provided (and continue to provide) to isolated Australian communities. Born in Adelaide, South Australia. Now I live in Sunbury, Victoria. In Adelaide. Both my primary and high schools have been bulldozed and replaced with shops and housing developments. Not sure what that says about my education. Yes, and I’m not saying what it was. I wasn’t a naughty child. I was too concerned about upsetting people. Sure, I was probably naught at times but not on purpose. Why upset people for no good reason? Although I do remember sneaking into the kitchen early on Saturday mornings and taking the sugar biscuits from the barrel on the cupboard. We were supposed to take the biscuits on top, but they were boring. So when no one was looking, I burrowed down with my hand to feel for sugar. I had lots of favourite books. Anne of Green Gables series, Swallows and Amazons and A Wrinkle in Time (my first science fiction book). And I loved books on space and legends from around the world. My husband, David Harris. He is a nice person and an awesome writer of adventure stories. Except he lets his characters run loose. They jump out and surprise him. Purple, curry of any kind and Galaxy Quest (oh and The Croods and The Bee Movie). I’ve just discovered it is not possible to name just one movie. Who inspired you to write? It is something I have always wanted to do and love doing. Stories are important and exciting. I am always encouraged by my readers to tell me that they like my stories or that they laughed so much they 'threw up'. Or slept with the light on because my story freaked them out. Or that they thought the person in the story was them. By just doing it. So many people would like to write and get all worried about it. Just tell a good story and see what happens. Although I did do a TAFE course on writing — several actually. But it was really to make me do the writing. It was a schedule I had to keep and couldn’t put off. I did get a husband out of it, though. David Harris was my writing teacher. He gave me an A so I married him. I began writing stories as soon as I could put sentences together. I wrote my first story up a tree in my Nan’s back garden when I was about nine years old. My first published writing was when I was in my early thirties. Why did you want to be a writer? It’s a drive, something I have to do. It is exciting and leads to meeting awesome people, having adventures in unlikely places. Writing is freedom and I enjoy entertaining people with stories. By working hard at it, keep my eyes and ears open, daydreaming, asking 'What If?' and letting the idea move forward, and keeping notebooks. Lots of notebooks. Do you have a special place where you write? I have written up a tree, on a cruise ship, in planes, schools, libraries, in bed, cafes — many places. It is good to change the place you write because it changes how you think. Have you had any funny or embarrassing moment as a writer? Knit, read, walk, garden, play with my grandchildren, watch movies, and I’m learning to speak Bahasa Malayu (Malaysian language). What would you have chosen to be if you were not a writer? A gardener or photographer. Still something creative. Ruth, from the Bible book of the same name. She was loyal, loving, and I would like to spend time with her. And the writing in that book is beautiful and poetic. Some of the best words ever written are those used by Ruth when she talks to her mother-in-law Naomi about sticking with her. I love the full moon, the scent of flowers, swimming in very large pools, honesty, hugs, and I can’t decide if my favourite colour is pink or purple.